The Columbia River - "A Photographic Journey" - My own "Corps of Discovery"
"My Own 'Corps of Discovery'"
As with any major expedition, it takes a team to make the journey successful. Lewis and Clark's "Corps of Discovery" consisted of themselves, 32 men, one woman, a baby, and Captain Lewis's newfoundland dog named "Seaman". The following is my own "Corps of Discovery". 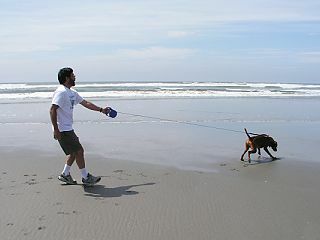 Gene and Riley at Sunset Beach, August 2003. Gene has made quite a few trips with me. 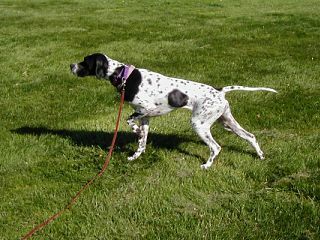 His first was to the beach in August 2003, and his second was walking in the Post Office Lake area. 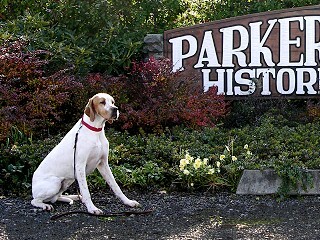 Riley and Gene have walked through the Twin Tunnels at Mosier and have enjoyed the Sandy River Delta's off-leash dog park. Gene says I make too many and too quick of stops for him to get any fishing done. Riley however thinks the stops are GREAT !!! Riley at Sunset Beach, August 2003. 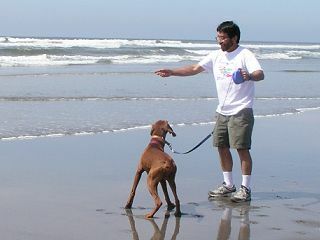 Riley has done a few trips as a Corps member, but the trip to the beach in August 2003 was among his favorites !!! Riley really enjoyed the beach !!!!!!!!! I'm not sure Gene was having as much fun. Lissa is a fantastic traveler and goes on quite a few of the excursions. 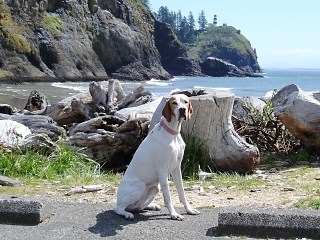 Pictured here is her on the trip to the Pacific Ocean. Lissa on Hamilton Island, thinking that while Captain Clark walked the length of the island, he was probably much taller than her and the grasses didn't tickle his tummy. 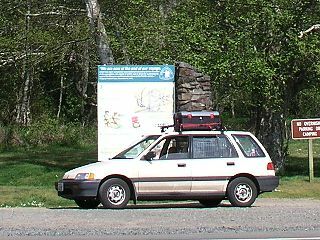 Josie at Megler Rest Area, April 2004. 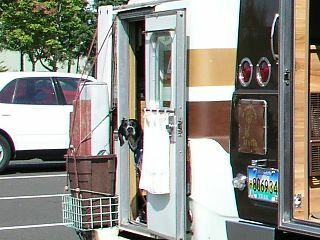 Josie did the epic one-day 300-mile journey to Fort Canby, Cape Disappointment, and the Washington side of the Columbia River, in April 2004. 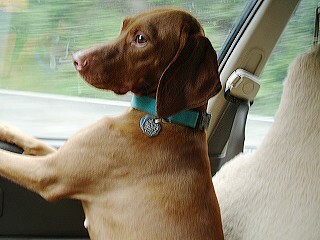 Her opinion -- way too many miles for an old lady and not enough fast food restaurants. 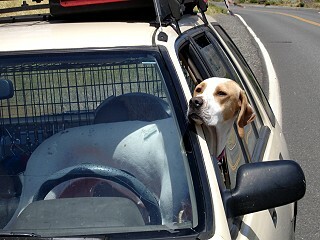 She said her trip up through the Columbia Gorge was much nicer as mom stopped at McDonalds. Josie is eleven in this picture. 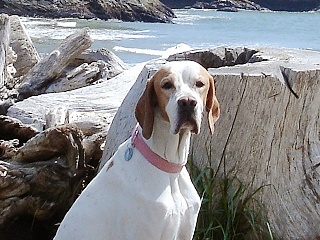 Genna posing at Cape Disappointment, April 2005. 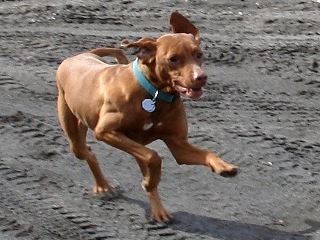 Genna did the second trip to Cape Disappointment and enjoyed running on the beach. She's done many trips with me, but I think she liked this one the best. Genna ready for next leg of the journey. 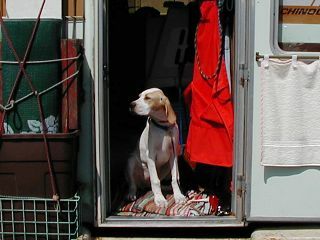 Baby Keeley sitting in Chinook at Rock Creek, April 2004. Just as Lewis and Clark traveled with Sacajawea's baby, my "Corps of Discovery" has a baby too. 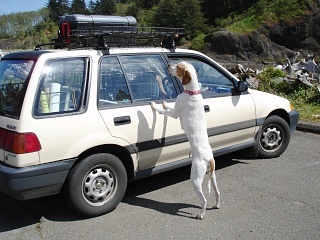 At 15 weeks old when this picture was taken, this was Keeley's first trip along the Columbia River. And no, she is not a well-trained puppy. She had to be put back into position at least 9 times before I could snap a picture. 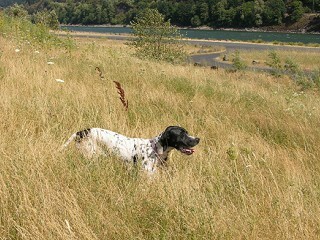 Grown-up Keeley on the search for the Carleton Watkin's Cape Horn near Celilo in June 2005. 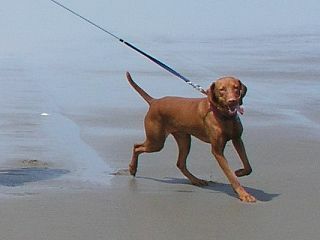 Corey is a young vizsla girl, prone to jerking at the leash, and totally impatient with the time it takes me to take a picture. She hates the water but loves the sandy beaches. 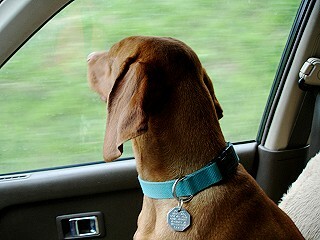 Car rides are one of her favorite pastimes. Corey just watching the scenery. 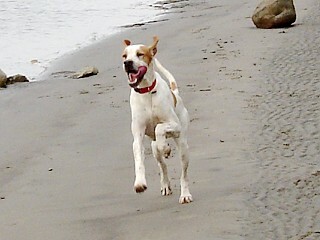 Beaches are made for running !!!!!!!! Picture that Corey took of Cascade Locks, June 2003. As you can see, her taste in photographs is a little more abstract than mine. 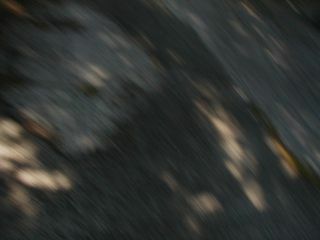 This is her picture of the concrete at the Lock. Trader joined the Corps of Discovery in late 2004, and went on the gorgeous fall excursion to Washougal and Steamboat Landing. He's not fond of posing for pictures. Trader enjoying Fishers Landing !!!!! Beaches are one of the perks to being a Corps of Discovery member. 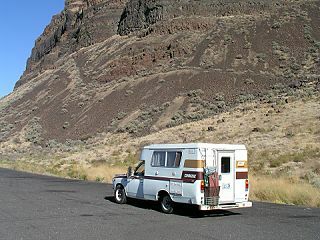 Little Chinook at Wallula Gap, September 2003. Little Chinook has journeyed with me on many trips to date from the Coast to Eastern Washington. Me and the rest of the "Corps of Discovery" sleep in the back. 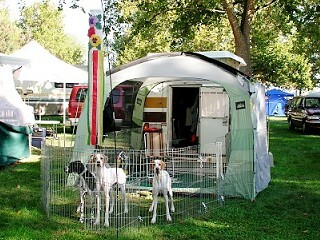 Little Chinook and the crew of the Corps of Discovery in camp at Columbia Park, Richland, Washington, September 2004. The crew on this trip, left to right, is Lissa, Keeley, and Genna. 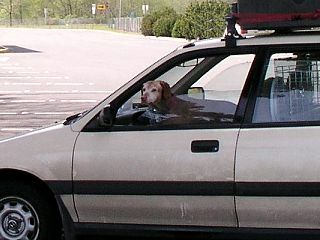 Honda at Station Camp, April 2004. Honda does the majority of the running around. He is exceptionally good at doing U-turns and backing up.